Currently listed at no.157 on the Under 18 Girls’ World Rankings and the eighth seed in Varazdin, Romania’s Alina ZAHARIA emerged as the surprise winner of the Junior Girls’ Singles title at the 2014 Croatian Junior and Cadet Open . She also won the Junior Girls’ Doubles competition with colleague, Arina SINGEORZAN. In the final ZAHARIA overcame host nation representative Dorina SREBRNJAK. In the semi final Dorina overcame Bianca CRISAN of Romania, whilst ZAHARIA beat Arina SINGEORZAN. 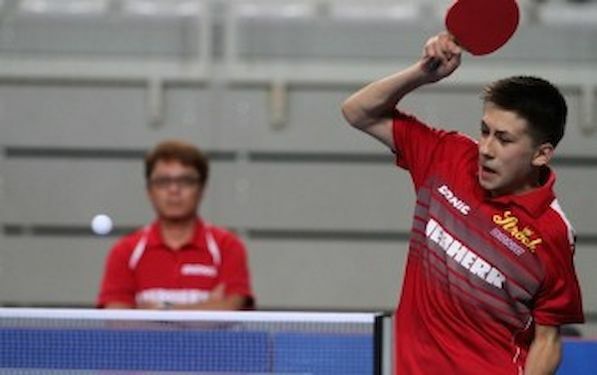 Austria’s Andreas LEVENKO clinched his first ever title on the ITTF Junior Circuit at the 2014 Croatian Junior and Cadet Open. The no.2 seed, he accounted for England’s Helshan WEERASINGHE, the no.10 seed, in the final. Earlier, LEVENKO had beaten Hungary’s Mate Buckner in the third round, before recording a quarter-final success against Romania’s Rares SIPOS, the no.5 seed. In semi final Andreas accounted for Russia’s Andrey SEMENOV. In penultimate round, Helshan WEERASINGHE accounted for Romania’s Alexandru MANHOLE, the no.9 seed. Helshan WEERASINGHE was second in the Junior Boys’ Singles event, but in the Junior Boys’ Doubles competition, it was the top step in harness with Slovenia’s Tom SFILGOJ. In final they overcame Hungary’s Mate BUCKNER and Bence MAJOROS, the no.5 seeds.